The time saving factor has become the dominating decision reason when procuring a bus washing system. This applies to both private coach companies and public transport companies. The logical, well thought-out, asymmetric wash brush arrangement on the ECOBUS accommodates this trend with an extremely effective washing result. Vehicles that are to be cleaned are washed quickly, which therefore reduces operating costs. This pays off especially when cleaning in shifts. In order to guarantee a long service life for this investment item, the frame parts, swivel arms and spray arches in this installation are made completely of hot dip galvanized steel. The bus pushes the rotating wash brushes on the brush pair that is in the mid-position outwards. This performs the front surface wash. 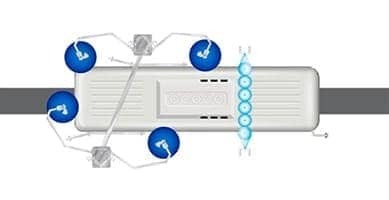 The first pair of brushes that is in the outer position only moves to the side of the vehicle once the front wash arms have been opened completely. 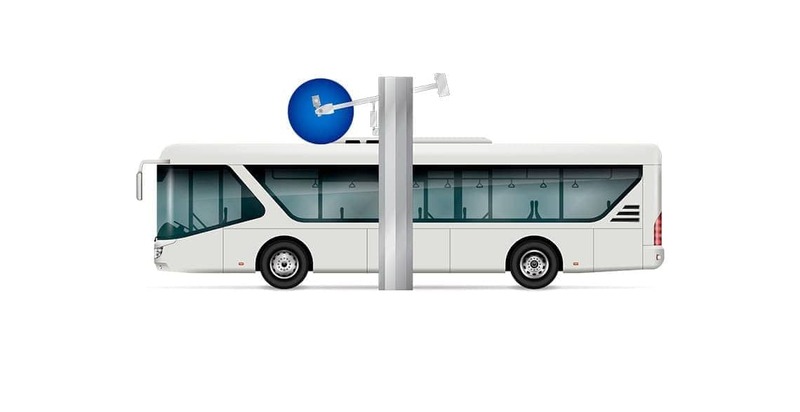 The bus moves through the wash system when the swivel arms are open. 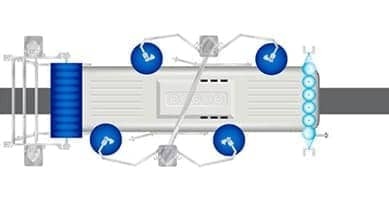 This presses the swivel arms pneumatically to the side of the vehicle. The rotating wash brushes in both brush pairs therefore perform the lateral surface cleaning. 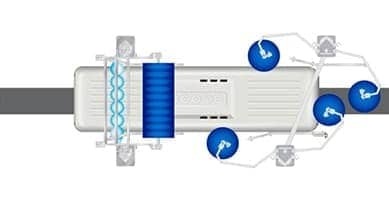 The rotating wash brushes in the first brush pair press against the vehicle rear pneumatically and therefore wash the rear surface from the outside to the middle of the vehicle. The wash brushes in the second brush pair complete the lateral surface cleaning. An additional horizontal brush system extension enables vehicle roofs to be cleaned thoroughly. The horizontal brush is available for different passage heights and passage areas.